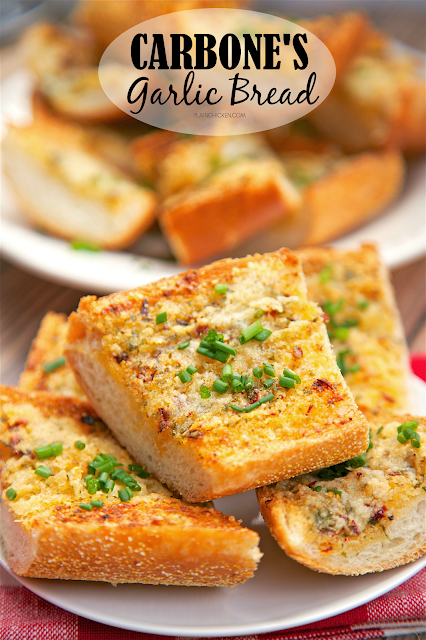 Carbone's Garlic Bread - recipe for the garlic bread from the famous NYC and Vegas restaurant. 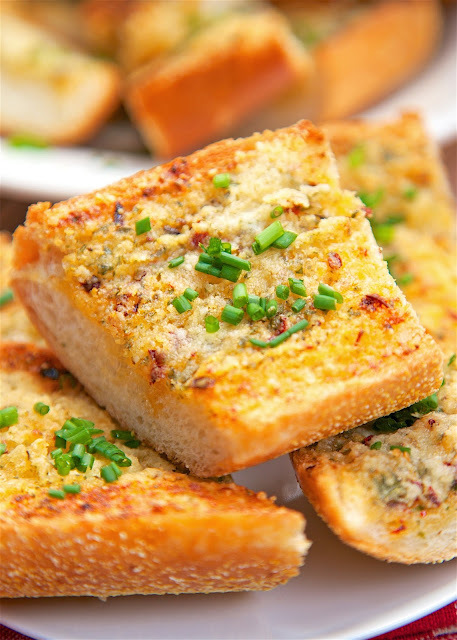 BEST garlic bread ever! Crispy, cheesy and a little spicy! You can make this ahead of time and refrigerate it until you are ready to bake the bread. I like to bake one half and save the other half for the next day. On our most recent trip to Vegas, we ate at Carbone in the Aria Casino and Resort. It was SO good! Chicken Legs and I both agreed that it was a must visit on every trip. The food was amazing and the service was perfect. One of our favorite things at dinner was the bread basket. I could have made a meal out of the bread! I recently found the recipe for Carbone's garlic bread and had to make it! O-M-G! 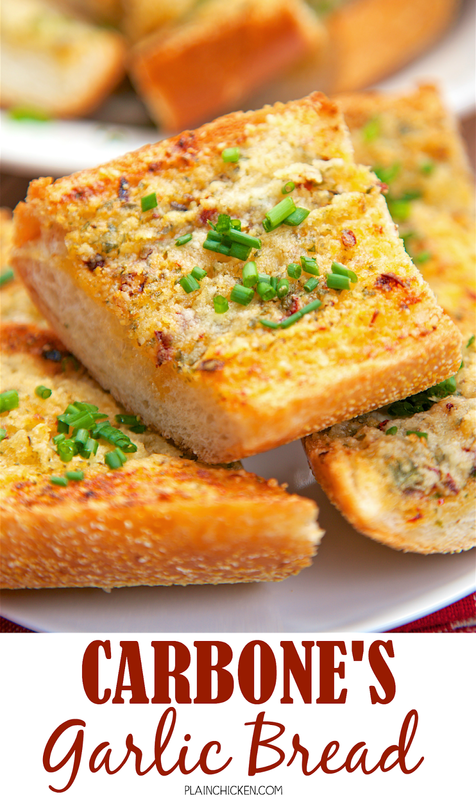 Best garlic bread ever!!! Crispy, cheesy and a little spicy. It was so good that I made it two days in a row, and I'm planning on making it again this week! You can make this ahead of time and refrigerate it until you are ready to bake the bread. I like to bake one half and save the other half for the next day. Place baguette cut side up on a foil-lined baking sheet. Stir together butter, olive oil, chile flakes, oregano, garlic, salt, and pepper in a bowl. Spread evenly over cut sides of baguette and sprinkle with grated parmesan. Broil until golden and slightly crisp, 2–3 minutes. Remove from oven and sprinkle with chives. Cut into 2-inch slices. This sounds great! Could roasted garlic be used or would it burn since it is already cooked? I think roasted garlic would be fine. Enjoy! Why can't I print this recipe ? How do i do it if I want to prapare this one day ahead? Sounds amazing, How do I do if I want to prepare this one day ahead?